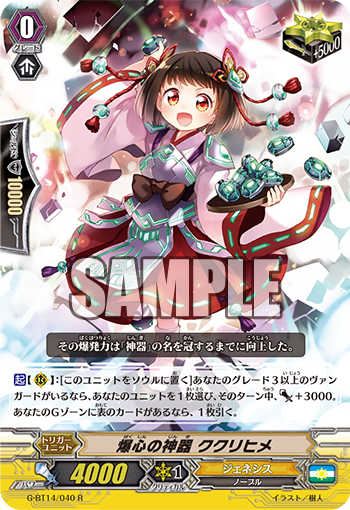 More Regalia support with a retrain of Kukurihime. 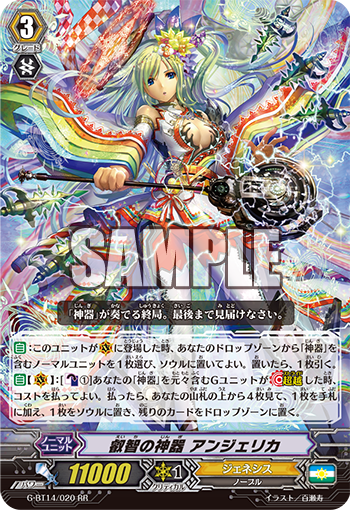 ACT (RC) [Put this unit into your soul] If you have a grade 3 or greater vanguard, choose one of your units, and it gets Power+3000 until the end of the turn. If you have a face up card in your G zone, draw a card. ACT (RC) 1/Turn [Choose 3 normal units from your drop zone with “Regalia” in their card names that is not this unit, and put them on the bottom of your deck] If you have a vanguard with “Regalia” in its card name, this unit gets Power+3000 until the end of the turn, if you have a face up card in your G zone with “Regalia” in its card name, draw a card.